Nidum Arts Centre is located at Neath College, and includes a purpose-built theatre with a 168-seater auditorium and two multi purpose ‘black box’ studios. Other features include a cinema screen and projector, high specification lighting and sound equipment and a suspension tower with flying equipment. With retractable seating and a removable stage, the main theatre can be easily transformed from a traditional Proscenium arch fixed seat venue into a multi purpose open space, ideal for events such as television recordings, stand up live music performances and theatre in the round. Both multi-purpose black box studios have a removable partition wall enabling us to offer the option of one large room, removable blacks and a beautiful floor to ceiling glass window side, providing a roomy and naturally lit modern space. 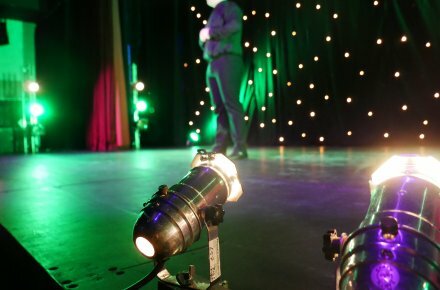 The studios also having a lighting system with small PA and a sprung dance floor making them ideal for smaller productions of dance, drama or music events. As a flagship facility for education in South Wales, Nidum Arts Centre is a centre of excellence for students in drama, dance, musical theatre and music performance. The Creative, Visual and Performing Arts (CVP) department regularly put on shows at the Arts Centre, and also use the space to exhibit art and design works, as well as photography and multi-media. The centre is also used regularly by our affiliated companies and external hirers including including Ovation Musical Theatre Company, Tan Dance and Lift Dance Company, Neath Amateur Operatics Society, KITE musical theatre company as well as many groups and companies based locally and nationally. The Arts centre also provides for several community based Arts groups including – UCAN productions, and Dance Wales. The Arts Centre is available for commercial hires at very competitive rates when not being used to support the curriculum, and is able to offer a unique and friendly service from its fully trained staff, from performances and exhibitions to education and community projects. If necessary to report for a visitor pass please continue up Dwr-y-Felin road first and report to the main reception on the left. It may be easier to park by the Arts centre first and then walk up.